This next-to-final issue of Inquiring Mind is dedicated to hunger in many guises and manifestations. The journal comes into your hands in formidable times of war, famine and climate disruption. Each day of this season, from the autumnal equinox on September 21 and continuing to the winter solstice on December 21, the hours of daylight shorten and the descent into darkness beckons. Solemn holidays commemorate this dark time: the ceremony of summoning and feeding Hungry Ghosts and the Day of the Dead, when the veil between worlds is stretched thin and the dead dance with the living. On the autumnal equinox of this year, hundreds of thousands of citizens converged in New York City for a peaceful march to the United Nations calling for attention and direct response to global climate change. This march occurred during the peak of farm harvest season, with improbable bounty being gleaned from North American fields of plenty while millions of people in the richest country on earth, most of them children, went to bed malnourished. As dharma practitioners and concerned citizens of this era, how do we take in and respond to the deep-rooted causes and conditions of hunger? What teachings and practices help to build resilience in the intensity of these times? These questions inspired the collaboration evident in this issue on hunger. A story often told by vipassana teacher Jack Kornfield helped us to focus on the different kinds of hunger and response available to an inquiring mind. In the refugee camps of Cambodia, Kornfield witnessed immense suffering among the survivors of the Cambodian Holocaust. He describes tiny vegetable gardens planted in the raw earth in front of crowded huts. To sustain these gardens, refugees walked a mile every day and waited in long lines for pails of water. In the parched heat of the camps, vigorous squash seeds germinated and bean plants twined up slim bamboo stakes. As they watered their gardens, the war-shattered families awakened to the unstoppable force of life. What nourishes this force of life in a world where 25,000 people die every day of poverty and hunger? Venerable forest monk Buddhadasa Bhikkhu, in his dharma teaching “Hunger and Happiness,” reminds us that there are two levels of hunger: physical and spiritual. Physical hunger is satisfied by the gift of food, shelter, clothing, medicine and protection from bodily harm. Spiritual hunger is harder to satisfy. It includes the hungers of attachment, craving and grasping. The more we consume, attempting to fill spiritual emptiness, the more we hunger. 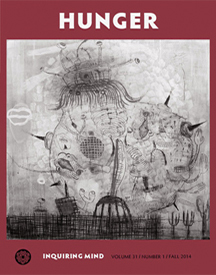 Both levels of hunger are addressed by the artists and contributors in this issue. In these pages, a fresh coolness of mind is invoked, arising from grounded practice infused with the unstoppable force of engaged meditation dedicated to meet the challenge and opportunity of a hungry world. Visionary Zen writer David Loy asks, “Can dukkha be translated as hunger?” Linking an individual sense of lack to collective “lack,” he suggests it is time for a broader understanding of the Buddhist path. Ven. Bhikkhu Bodhi challenges Buddhists to act, even to take radical political action, to save a world threatened by climate change and a global ethic of ruthless competition. Jennifer Russ shows how Buddhist Global Relief projects in Haiti, India and Cambodia empower women through work and education—to benefit not only themselves but also future generations. Over thirty years of friendship, Joanna Macy and John Robbins have inspired each other’s work for a life-sustaining world. Their exchange examines GMOs, factory farms, pesticides, community-supported agriculture, sustainable production and the power of compassion. Matthew Brensilver and Kim Allen discuss the Buddhist Insight Network’s recent survey, revealing common and contrasting needs, worries and hopes for teachers of color, teachers with young children and teachers who are aging. Insight teacher Tara Brach traces back all wanting to the desire to “be” love and to belong. When we trust in our mutual belonging, we will not be overwhelmed and can work together toward healing our world. Presented with a poem by Natalie Goldberg. When Wilbur Hot Springs burns, Barbara Gates remembers her wedding anniversary there, and reflects on the great forces of plate tectonics, geysers, galaxies and love. Nikiko Masumoto, farmer, artist and writer, works the same fields as her jiichan (grandfather) and reaffirms her family’s commitment to farm, to answer the call for sustainable food and to feed people. Organic gardener and lay Zen teacher Wendy Johnson shows the common roots of dharma and farm. With farmers from the Seneca Nation, she celebrates corn, beans and squash. We humans are creating enormous problems for the other living beings on planet earth, even threatening life itself. Wes Nisker suggests it may be time for us to leave.